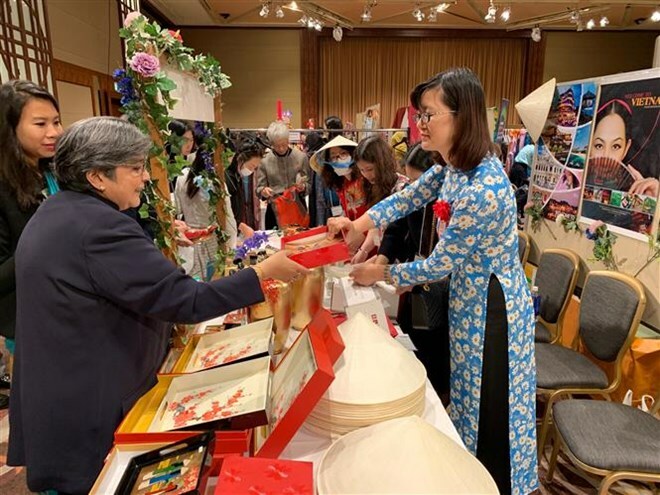 Tokyo (VNA) – The Women’s Association of the Vietnamese Embassy in Japan attended the 43rd charity fair of the Asia-Pacific Ladies Friendship Society (ALFS) in Tokyo, Japan, on April 10. The event is one of the ALFS’ biggest annual activities, aiming to raise funds in support of women and children in ALFS member countries. The spouse of Japanese Foreign Minister Taro Kono and other wives of high-ranking Japanese officials also attended the event. On the occasion, participants displayed handicrafts and traditional cuisines of their countries. The Vietnamese Embassy introduced Vietnamese silk, lacquer, and embroidery artworks as well as traditional cuisine to visitors. In 2018, the ALFS allocated nearly 1.3 million JPY (about 11,700 USD) to the Vietnamese Embassy to build water purification systems for the central province of Ha Tinh and to support children living in disadvantaged areas of Vietnam. This year’s proceeds will continue to be used for the installation of water purification systems in elementary schools in three districts of the central province of Quang Nam.